Thank you so much for watching and commenting on the 1st vlog darling. Very much enjoying our conversation. Thank you. And without any further ado lets bang on with the next one. Click here to watch video. So here we were, Mhairi & I, with 6 episodes and 2 teasers in the can and seemingly lots of options (since the Digital Revolution was now in full swing) but unsure which direction to go. There had been some initial excitement, as several big name production companies had seen some of our material and were interested in working with us, but that excitement faded pretty quickly when we realized that they wanted to go in a different direction with the show than we had in mind. 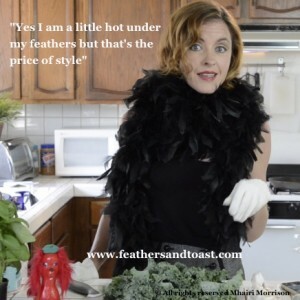 Maybe it was due to Mhairi’s brilliantly dead pan delivery, but it seems many in the early stages saw Feathers and Toast as an actual cooking show, and wanted to steer it in that direction (in fact one even suggested cutting the Behind The Scenes part) but as tempting as it was to go where the money was, and shape our show into what was currently working on the digital platforms and MCN’s, Mhairi and I knew this was a full blown comedy destined for television and that even if it meant we were going to have to go it alone for awhile and forego any financial support (that we really could have used), that was just what we were going to have to do until we could effectively show them the trajectory we envisioned for ourselves and why it would work. Youtube is a powerful creative development tool if used effectively. 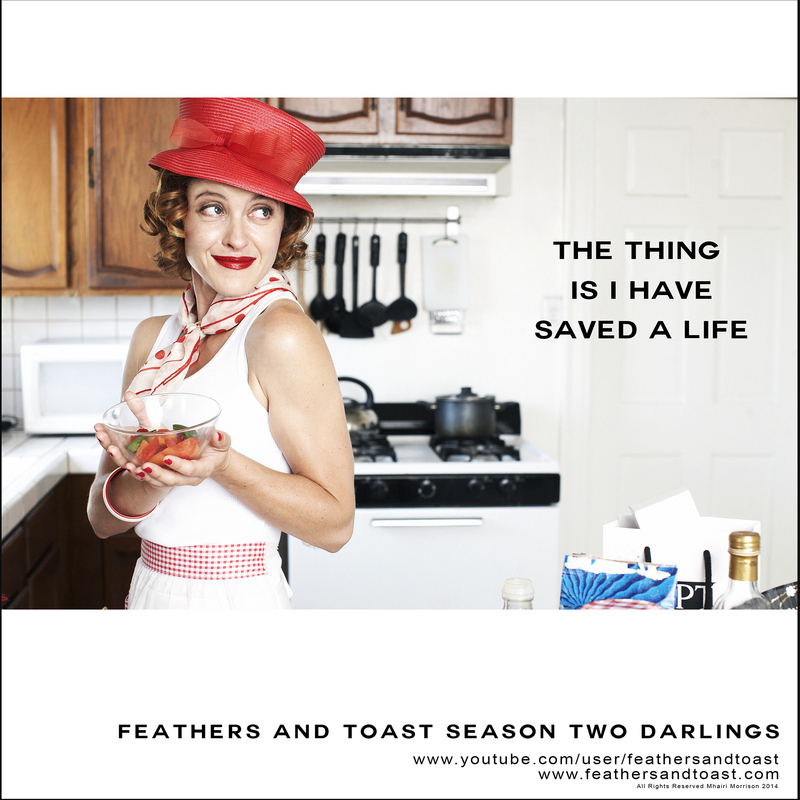 Almost immediately after we began releasing those early episodes of Feathers and Toast, we started getting invaluable feedback from the people, not industry people, but viewers, fans, the people we would be creating the show for in the first place, and one of the first bits of invaluable information we got is that they absolutely loved the back and forth between Diego and Tallulah. So I guess the answer to the ancient question “To Youtube or Not to Youtube” for us ended up being a resounding yes! To Youtube. And also I’d like to take a moment to acknowledge Diego for literally just being himself. 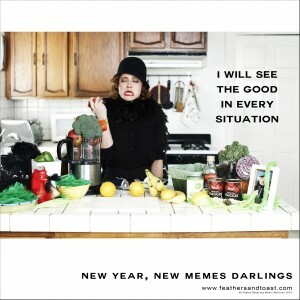 Right before we had begun filming our Director, Barbara Stepansky, had suggested Tallulah have someone to talk to, like the camera man, so we had attempted to cast one of my Second City friends to play the camera man and that fell through, but then I had one of my crazy ideas. Up until then we had just been dear friends helping each other out. 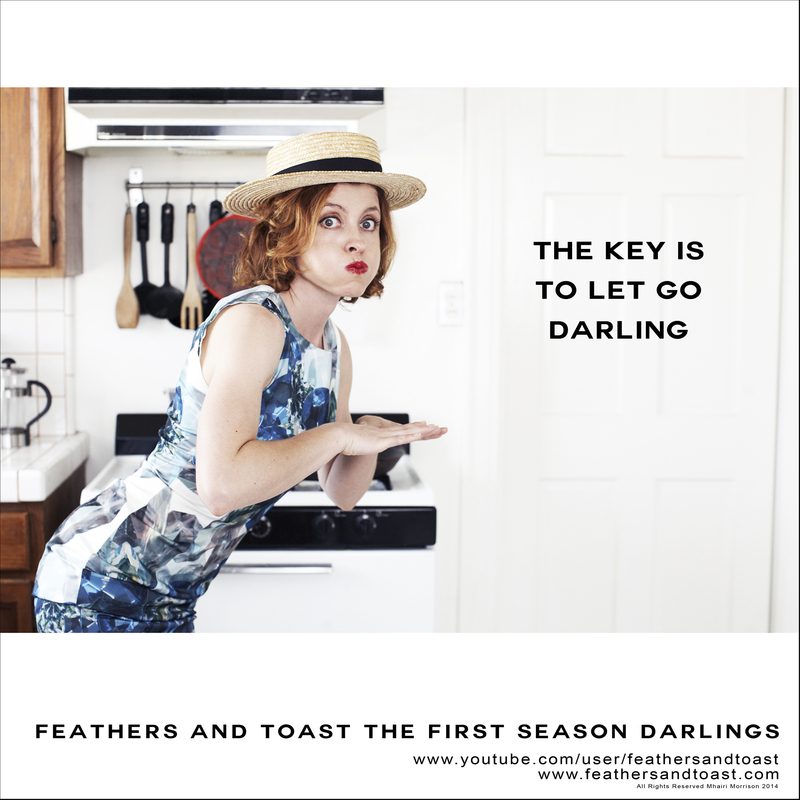 I had loved her idea for Tallulah and wanted to see her succeed so I shared a few resources (my notes, my kitchen, my husband) and the result was a Hard Drive full of precious footage just waiting to be edited by someone, but I never imagined that that someone was going to be me. “Will you be my editor?” That question brought up all kinds of issues for me. Editing is a commitment, its time intensive, its mind consuming (particularly when your dealing with unscripted footage) and its personal (as you can get very attached to what you create) and I knew I needed to think long and hard before I made that kind of commitment to a project that I knew was so personal for her, essentially her creative baby. 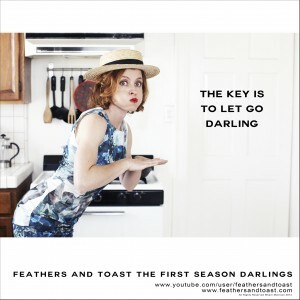 Over the course of those several weeks, not only did we mold that footage into 6 episodes and 2 teasers, we created what would become the signature Feathers and Toast style with the old timey music, the title cards and the structure of an opening, a recipe and a glimpse into Behind the Scenes (something we had no idea we were going to do before we started editing). In fact, over the next couple weeks I will be sharing each of those early episodes with you again and show you how our now structured show was formed after the fact from the clay of Mhairi’s brilliant unscripted Improv. We still find it quite amazing. Don’t try to edit the trailer/teaser for your show before you have edited the show itself. Trailers/Teasers are hard, there is just no way around this. When making a trailer you are tasked with not only telling your story in the most concise way as possible, but you also have to reach into the minds of your potential fans and guess which few quick seconds of your show will catch their eye and make them curious and/or excited enough to want to take the time to watch it. 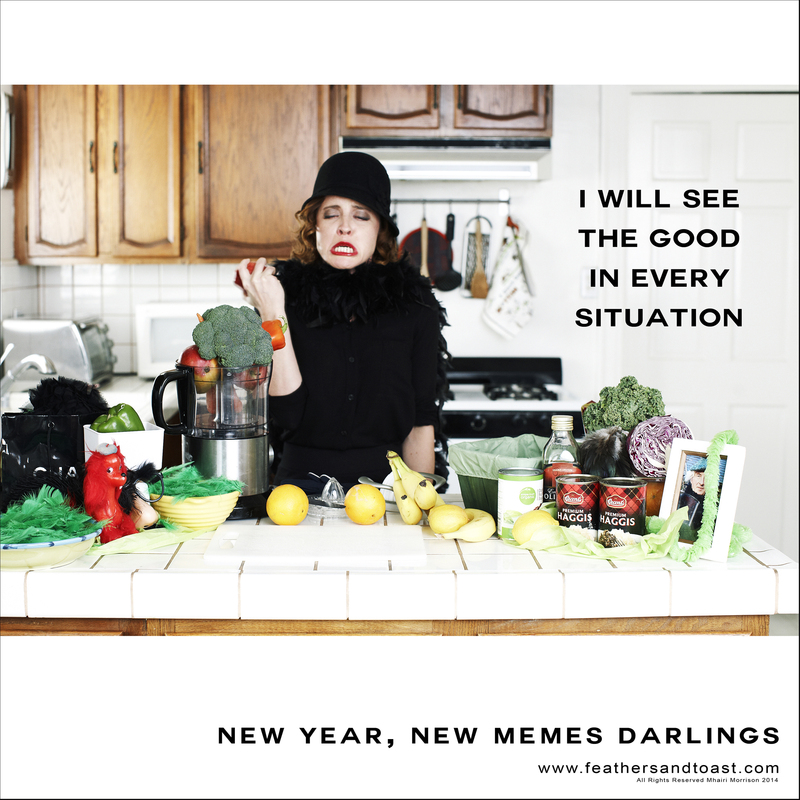 Essentially you need to be a mind reader on mass scale. So with all that said, it is hard enough to create a trailer in the best of circumstances, when you know your footage and your story well, but to try to create it while you are still getting to know your footage and still forming your style is darn near impossible. We know because that is precisely what we did the first time around, but never again. In the early days Mhairi and I were just two friends with similar dreams who met at a Women In Film breakfast and started a goal group for two. We would get together every Monday evening, discuss what we learned from the previous week, share our goals for the next and then wax philosophic about things like the importance of a performer not waiting around for someone else to give them that career-changing role and what success really means. Both of us had had “success” in the past, with some impressive credits to prove it, but had not necessarily been happy in the process. Upon further exploration we realized that for us, the entire reason we were drawn to this business in the first place was because each of us had had moments in our past where we got the chance to feel what its like to be a part of an amazing creative community, to feel the incredible warmth, passion and intimacy that comes when you are working with a community of great artists who know how to put their egos aside and work together to create something better than they could have created on their own. We craved that feeling, so much so that we realized having it was our definition of success and we committed to each other that night that one way or another we were going to create it. At the same time we were having these discussions, Mhairi met a man who would become our Feathers and Toast guardian angel, Gideon of Paramount. (haha – I couldn’t resist Gideon, just love the way that sounds) Anyway Gideon had come to see Mhairi’s stand up and afterwards suggested that maybe she choose one of her characters and build a show around it (as so many comedians have done before – Seinfeld, Ray Romano etc). Well this just sent Mhairi’s imagination a flying and later she shared with me an idea for a character she had percolating called Tallulah Grace. Tallulah fancied herself the savior of the lonely cook, encouraging single women to dress up and play in the kitchen even if they were just cooking for themselves, especially if they were cooking for themselves, but what Tallulah would never want to admit to anyone was that she was that lonely cook. 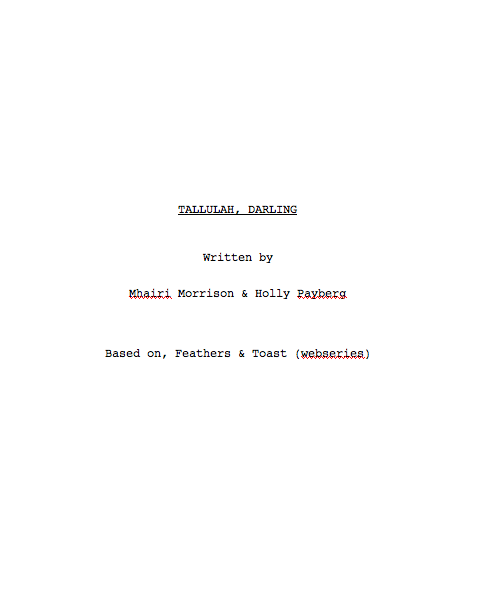 I fell in love with Tallulah immediately and, me being me, suggested that Mhairi not just put together a pitch but rather that she go ahead and shoot something so that the powers that be could see her as that character. We talked at length about what she could shoot that would show off the potential arc of this character but would still be cost effective and high quality and, as has been the case since the beginning of this project, help started jumping on board. Do not wait for someone to come along and create the perfect opportunity for you to show your unique brand of talent or you may die waiting. If you have a story inside you that you are inspired to tell or a character you were born to play, then do what you have to do to make it a reality based on whatever resources you have at your disposal. If you don’t have much then keep your idea small for now, or shoot the piece of the idea you can afford and still do well. Enroll your friends, borrow equipment, make it happen. In this business if you want people to believe in your story or see you as a certain type of character you are going to have to show them, especially if its unique and original as those are ultimately the most memorable but initially the most difficult to sell. 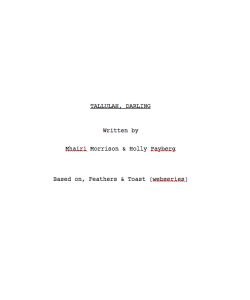 Next post will talk about the importance of loving your editor, but in the meantime here’s a memory of the humble beginnings of Tallulah Grace.